To paraphrase Steven Covey (7 Habits of Highly Effective People): It doesn’t matter how fast you climb if you’re tackling the wrong hill. I wrote my first Writer’s Mission Statement in 2010, before I had any glimmer that publishing would be in my near future. I’ve updated it every year, and each year it evolves. I started out focused on young readers, but then expanded to adults. I’ve added explorations of creativity and format (short, long, serials, everything in between). Most recently, I’ve been spending about half my time writing under a penname (read more about this in For Love or Money). While the money from that goes primarily to my “special cause,” the writing of the books themselves fulfills almost all the key points in my Mission Statement… which is an interesting development, because it highlights how making money from my books was only one of many goals I had. Normally “reaching a large number of readers” is coupled with making actual dollars for your bank account, but in this case, they’re decoupled. And yet… I continue to devote a large chunk of my time to that endeavor because it allows me to flex my writerly muscles in ways that are wholly consistent with why I’m in this game. I’ll walk you through my Mission Statement and how to create your own. To leverage my background in science, engineering, politics and life, to create compelling stories and characters that pose moral questions to readers and make them think and feel in new ways. To continually seek out new ways to improve my craft. To be a leader and member of a supportive writing community. To create a body of works that reaches a large number of readers and leverages innovations in technology and storytelling to explore the reaches of my creativity. But understand who you are first. That way you won’t spend the next five years climbing a hill only to find—once you crest the top—that your happiness lies on another hill altogether. To leverage my background in science, engineering, politics and life, to create compelling stories and characters that pose moral questions to readers and make them think and feel in new ways. This statement is a great distillation of why I wrote Open Minds, as well as pretty much every novel I’ve written, including my penname works (which are romance)—I love to make my readers think in new ways, and emotion is often the pathway to that. I’ve found that the stories I love the most (both the ones I’ve written and the ones I read) are emotionally resonant while also engaging my brain. That’s simply where I live as a writer. · A girl in a telepathic world who has to mind-control everyone she loves to fit in. · A man who collects life-energy debts in a cruel world that decides who is worthy of living and dying. · A boy who wants to be a machine because they’re better—at everything—than humans. It took me some time to fully embrace my geeky tech side in my novels (now it shows up even in my romance)—to acknowledge that I wasn’t just there to entertain but to engage reader’s brains. When I did embrace that idea, that is when my writing really came together. I think we always function better—as human beings—when the many facets of ourselves are integrated. My original: To have every story be an improvement in craft. New: To continually seek out new ways to improve my craft. You should be constantly evolving as a writer, but the learning curve is most steep in the beginning. For a long time (years), every novel I wrote was an improvment in craft. And, in some ways, that’s still true. But after 71 titles under SKQ and another 20+ under my penname, almost 20 of which are novels, I’m not a beginner anymore. I’ve entered a true working phase with my writing. I have the skills to craft stories that sell—my challenges now are in the realm of increasing my productivity and crafting a body of work that I’m excited about. But this is also a dangerous time. My greatest fear has always been the stagnation that I see some writers experience. So I have to remain intentional about seeking out ways to challenge myself. For example, writing a short story that’s more literary than my other work (recently for the Illustrated Robot anthology). Or exploring the 50k-novel format instead of my more typical 80-100k. Or playing around with a collaborative work with other authors centered on Zen Bacon Quotes (something that hasn’t, yet, seen the light of day). In the beginning of my career, success was intimidating, because I wasn’t sure I could bring that game again and again. My earlier attempts to take my craft to the next level included hosting my own creativity workshop, stretching myself by writing serials, attending a nine-month workshop on writing a screenplay, as well as attending a four-day writing intensive workshop led by bestselling authors. Now that I’ve matured in my craft, the need for striving is still there, but there are times when I simply use the tools I already have to craft a story. This is fine as long as I’m also “continually seeking out new ways to improve my craft.” This seeking will keep me out of the still waters, plus my large production rates (over 500k publishable material in 2015) is constantly churning the deep waters of my mind. I think the danger of stagnation is especially great for indie authors, because the temptation is to write fast, produce large volumes of work, but not push further in improving the quality of those works. But this is precisely backwards. Quality does matter for sales (especially quality in storytelling). 2009 – 317k – An explosion of writing as I started; only one published novel (107k) came out of this. 2010 – 121k – This is when I learned how to edit… and published that 107k novel through a small pub. 2011 – 168k – This is when I first indie published. 2012 – 158k – This is finishing my first indie-published trilogy. 2013 – 287k – This is when I began experimenting with serials and seriously trying to up my production rate. 2014 – 575k – Unlocked a productivity improvement through substantial, concentrated effort. 2015 – 580k – Writing under two pennames and still working on boosting productivity. 2016 – (800k projected) – Dictation is taking me to 11 with my productivity. I instinctively started writing at a fevered pace, slowed down as I improved my craft and figured out how to revise, then picked up the pace again as I consciously worked at improving my productivity. I firmly believe what Ira Glass says in his inspirational video: that you must produce a large body of work in order to reach your potential as a writer. This tension between the two poles—publish fast vs. publish well—is one that’s felt keenly in the indie publishing world. 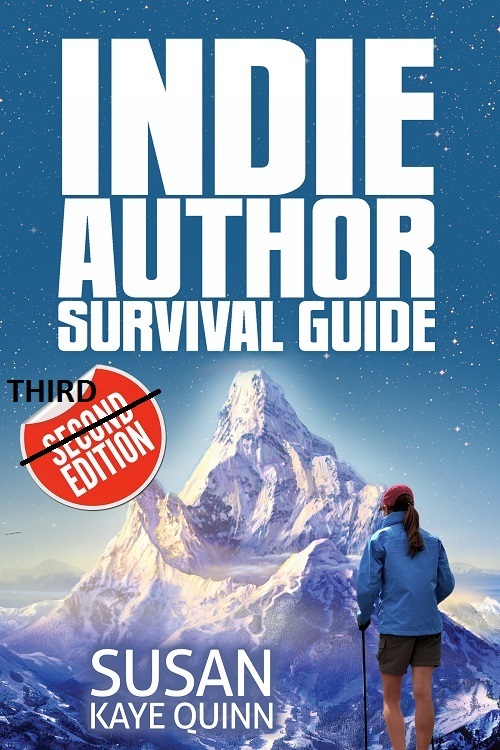 There is enormous pressure on indie writers to produce work quickly—a striking difference with the trad-pub world, where releases are spaced out and writers are sometimes barred from even submitting their work too quickly. When you’re an indie author, you have to find that balance yourself (rather than have it externally imposed). Early on, before I was published, I just wanted to “reach a large number of readers.” And that’s still my goal (and always will be). But now I see the value of writing something even if it won’t (likely) be a runaway hit (my middle grade Faery Swap). I see the need to write the story that’s in your heart even if it’s not in the schedule (Debt Collector). And I see the value of looking long-term at building a “body of works” that include a range of stories, not just the ones that may (or may not) sell. Creativity is your most valuable asset in this business: it has to be nurtured and grown, even if time spent doing that doesn’t always reflect in an immediate sale. (I also believe that it will be reflected in sales, eventually.) At the same time, I see the value of having works out there, selling, growing a fanbase for me, and providing income so that I can justify all those ridiculous hours that I spend at the keyboard. I encourage you to spend time thinking about this—publishing fast vs. publishing well—and find your personal balance in there. This part of your Mission Statement will be instrumental in guiding your future decision-making. This part has been a constant throughout the last seven years of my writing life, but the form of it has morphed over time. In the beginning, it was forming a writing group, going to conferences, exchanging weekly critiques, starting a blog. Then it became full-manuscript critiques, deeper friendships with writers, broader social reach with readers through publishing. 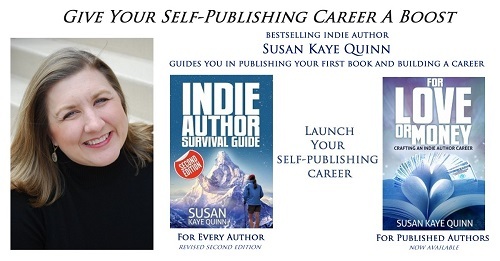 Then it became leadership in this indie community, membership in indie author groups like the Indelibles and Emblazoners, gathering publishing teams of cover artists and editors, and remembering to have fun along the way. And figuring out how to not let social media eat away at my productivity while still keeping a finger on the pulse of the quickly changing publishing world. 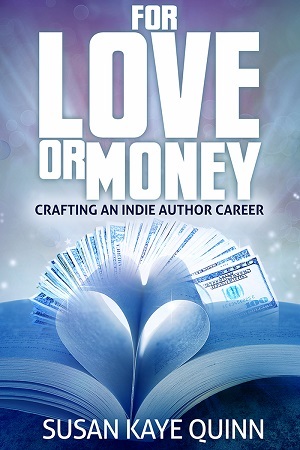 Just this last weekend, I formed a Facebook Group for Indie Authors (For Love or Money – join us!) to facilitate my ability to help my fellow authors (through the third edition of this book, which I’m blogging in the group, as well as giving away monthly consults on the business). This part is deeply rewarding to me, so I’m always looking for ways to do it better. For some writers, your Mission Statement may read: “avoid social media at all costs.” And there are authors who are successful without it ( my penname is very successful with very minimal social media presence). Social media is definitely not necessary. But for me, being part of the writing community was integral at every step of my development as a writer: in finding critique partners, in understanding the market, in knowing when to leap into indie publishing. I wouldn’t be where I am without my connection to that community. And this book is part of feeding my experience back into that community, to help my fellow writers on their journey. I do this because it’s part of my core values, but I’ve also seen the manifold benefits of it over the years in everything from support to opportunities to sales as well. This is an excellent topic! Thank you. It resonates with me. I've spent 20+ years writing in business, marketing, and nonfiction, and I liked it but I didn't *love* it. Then I accidentally got into fiction through a ghostwriting gig I accepted on a lark–and discovered that fiction writing and editing is where "my happy" lives.